You need fresh and clean air in order to stay healthy, and so does your vehicle. Your car is equipped with engine and cabin air filters that are designed to filter out dirt and debris in the air. The engine air filter keeps this dirt out of the engine, and cabin filters keep this dirty air from getting in your lungs. Your engine and cabin air filters need to be changed on a regular basis. One sign of a dirty engine air filter is reduced acceleration when you step on the gas. 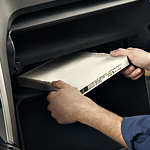 You will notice a reduction in the cabin air flow when the cabin air filters are dirty and need to be replaced. At Lion Country Kia conveniently located in State College, you can get your filters checked and changed. The service department is able to provide a wide range of vehicle maintenance and repair services to keep your vehicle running at its best.